Continuing my survey of recent papers on junk DNA, I stumbled upon a review by Subash Lakhotia that has recently been accepted in The Proceedings of the Indian National Science Academy (Lakhotia, 2018). It illustrates the extent of the publicity campaign mounted by ENCODE and opponents of junk DNA. In the title of this post, I paraphrased a sentence from the abstract that summarizes the point of the paper; namely, that the 'recent' discovery of noncoding RNAs refutes the concept of junk DNA. 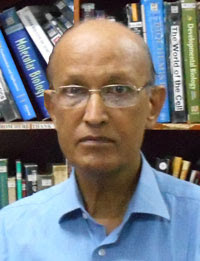 Lakhotia claims to have written a review of the history of junk DNA but, in fact, his review perpetuates a false history. He repeats a version of history made popular by John Mattick. It goes like this. Old-fashioned scientists were seduced by Crick's central dogma into thinking that the only important part of the genome was the part encoding proteins. They ignored genes for noncoding RNAs because they didn't fit into their 'dogma.' They assumed that most of the noncoding part of the genome was junk. However, recent new discoveries of huge numbers of noncoding RNAs reveal that those scientists were very stupid. We now know that the genome is chock full of noncoding RNA genes and the concept of junk DNA has been refuted. Major discoveries like the one gene-one enzyme hypothesis, demonstration of DNA as the genetic material and finally the elucidation of the double helical structure of DNA in 1940s and early 1950s set the stage for emergence of molecular biology. Parallel cell biological studies during this period also indicated a correlation between rate of protein synthesis in a cell and the amount of cytoplasmic RNA. Following the proposal of George Gamow, a physicist, about the triplet genetic code and possible involvement of RNA in the transfer of information from DNA to proteins, Crick proposed the 'central dogma of molecular biology' to suggest the paths of information transfer between nucleic acids and proteins, with the limitation that the information cannot flow back from protein to nucleic acids. With emphasis on proteins as the central phenotypic determinants and the continuing enigma of heterochromatin, which largely appeared to be ‘gene desert’, enriched in repetitive DNA sequences and claimed to be inert in transcription, the many observations in 1960s of a large variety of heterogeneous nuclear RNAs remained ignored. Curiosity in the nuclear RNAs that do not see the face of cytoplasm appeared to be quelled by concepts of ‘selfish’ or ‘junk’ DNA in the early 1980s, notwithstanding the fact that active transcription of typical heterochromatin regions and repetitive and other noncoding DNA sequences was well demonstrated in 1960s and 1970s. With a few exceptions like the hsrω and roX transcripts in Drosophila and the Xist RNAs in mammals, the noncoding RNAs remained largely ignored for nearly two decades. The discovery of RNA interference and sequencing of different eukaryotic genomes, including the human genome, led to revisits to possible significance of noncoding RNAs (ncRNAs) in the new millennium. The occasional identification of ncRNAs in early 2000s has in recent years transformed into a ‘tsunami’, resulting in concepts of ‘selfish’ or ‘junk’ DNA themselves becoming junk. There is now increasing realization that the subtle and large phenotypic effects of heterochromatin and the existence of diverse nucleus-limited RNAs reported through painstaking genetic and biochemical studies that were undertaken before molecular biology had grown fully, can be largely related to the enormous diversity of short and long ncRNAs now known to be produced by all genomes. Although Crick’s proposal of the Central Dogma was only about the directions of information transfer, its mis-interpretation due to the great emphasis on the central roles of proteins and the reductionist linear approach of molecular biology that led to widespread belief in concepts of 'selfish' or 'junk' DNA, delayed the appreciation of multi-dimensional roles that ncRNAs actually play in maintaining homeostasis in complex biological networks. There are two (major) things that bother me about this review. First, even if there are 100,000 functional noncoding RNA genes—an absurdly high number—that would still only account for a few percent of the genome. The logic of the argument against junk DNA is fatally flawed. Five Things You Should Know if You Want to Participate in the Junk DNA DebateSecond, there is an extensive literature on the subject. It includes papers that discuss the actual history and papers that discuss the role (or not) of noncoding RNAs. Many of them defend junk DNA and point out the abundant evidence for the concept. Subhash Lakhotia ignores most of those papers in his review. This is not good science. It's 2018, why are papers like this one still getting published? What happened to peer review? I close with another quotation from this paper. The irony is palpable. The present review briefly examines history of development of these concepts and how misunderstanding and/or mis-interpretation of some concepts thwarted the appreciation of great functional significance of the noncoding RNAs in biological organization. NOTE: Most biochemists and molecular biologists had a very protein-centric view of genes and gene expression. They believed that a gene could be defined as a DNA sequence that encodes a protein. I do not dispute that claim. Indeed, I suspect that it is still the dominant view today—it certainly is the view taught to undergraduates by most professors. However, one should not write the history of an idea based on the misunderstandings of the average scientist outside of the field. It's the experts who count. Those experts had good reasons to believe that most of our genome is junk and those reasons are as valid today as they were forty years ago. Subhash Lakhotia has been sent a link to this post. Looking forward to his response. I thank Larry Moran for picking up this historical perspective. I do not agree with most of his points as the critique in this blog follow the same path that I have argued against. The fact that many text books continue to carry the protein-centric definition of gene does not mean that this definition is correct. Galileo Galelei had to suffer for championing of heliocentrism that went against the then prevailing dogma. Moran incorrectly states “He repeats a version of history made popular by John Mattick.” Actually, I have not agreed, since the 1970s, with the view that large parts of genomes in most organisms are of no consequence, a view later articulated and popularized by naming large chunks of genome as ‘selfish’ or ‘junk’. I maintain that the proposals for existence of 'selfish' and/or 'junk' DNA were based largely on ignorance of life's complexity that is not immediately amenable to molecular biology's reductionist linear logic. For those researchers who ignored the many studies on RNA published in the 1960s, I would not say "those scientists were very stupid" as paraphrased by Moran. I would rather emphasize that those studies were ignored and forgotten as the concepts of 'selfish' and 'junk' DNA were popularized by followers who did not want to question. It is also ironic that because the views expressed in my article do not match those held by Moran and others, he states "This is not good science. It's 2018, why are papers like this one still getting published? What happened to peer review?” Disagreement of views does not mean flaw in peer review. Obviously all that has been published in support of and against ‘selfish’ and ‘junk’ DNA could not be covered in a brief article! I can also state that it is 2018, and let us more openly question the concepts like 'selfish' and 'junk' DNA. I quote from the conclusion in my another article on heterochromatin, ncRNAs and epigenotype (Lakhotia 2017, Nucleus 60:299–314): "Using the reductionist approach, it is indeed difficult to justify the wide variations in relative as well as absolute amounts of chromatin in the form of constitutive heterochromatin. However, biological systems are not created by design but are products of random events and natural selection. F. Jakob in 1977, warned against comparison of action of natural selection to that of an engineer. He stated 'This, however, does not seem to be a suitable comparison. First, because in contrast to what occurs in evolution, the engineer works according to a preconceived plan in that he foresees the product of his efforts. Second, because of the way the engineer works: to make a new product, he has at his disposal both material specially prepared to that end and machines designed solely for that task. Finally, because the objects produced by the engineer, at least by the good engineer, approach the level of perfection made possible by the technology of the time. In contrast, evolution is far from perfection. This is a point which was repeatedly stressed by Darwin who had to fight against the argument of perfect creation. In the Origin of Species, Darwin emphasizes over and over again the structural or functional imperfections of the living world.' Thus if a species’ genome can take care of greater amount of constitutive heterochromatin without tipping the balance of natural selection, it survives and continues as well as another species which maintains a much smaller proportion." We should not forget, as also argued by J. Monod (1971) in his historical essay, that Biological systems are products of chance and necessity, and, therefore, do not always follow the reductionist linear logic that human mind tends to apply. You're basically confirming everything Larry wrote. You get the history of the term junk-DNA wrong, and you are wrong when you insist that scientists used to think only protein-coding genes mattered. That is just flat out historically incorrect. It's not just a matter of opinion, it reveals a failure of proper historical scholarship. You haven't done the research and read the historical papers and correctly represented the views expressed therein. So when you manage to get a paper published that gets that history wrong, that really does constitute a failure of peer review. Both you and the reviewers are perpetuating a historical falsehood, a myth. "For those researchers who ignored the many studies on RNA published in the 1960s, I would not say "those scientists were very stupid" as paraphrased by Moran. I would rather emphasize that those studies were ignored and forgotten as the concepts of 'selfish' and 'junk' DNA were popularized by followers who did not want to question." Okay, but then you're just plainly incorrect about how the case for junk-DNA was constructed in the first place. It was never based on ignorance, nor the fraction of the genome that codes for protein. It is historically false to insist that it was. Like you, I grew up with the phage group and we probably went to some of the same meetings in the 60s an 70s. Our smart and knowledgeable mentors were never stupid enough to believe that all genes encoded proteins because they were actively working with genes for ribosomal RNAs, tRNAs, and regulatory RNAs. By 1980 they also knew about snRNAs and Sydney Altman had already done some work on the noncoding RNA that would win him the Nobel Prize. It was these knowledgeable scientist who came up with the ideas of junk DNA and selfish DNA, not through ignorance but because of a deep understanding of molecular biology and evolution. It wasn’t ignorant scientists who understood the importance of the genetic load argument and it wasn’t ignorant scientists who realized that junk DNA explained the C-value paradox. It was knowledgeable scientists who realized that most of our genome was occupied by fragments of degenerative transposons that couldn’t possibly have a function. It was smart and knowledgeable scientist who understood the weak power of natural selection and the importance of random genetic drift. They realized that a genome full of junk was perfectly consistent with a correct understanding of evolution. Later on, it was knowledgeable experts who realized that spurious transcription is a fundamental property of biological systems. They understood that junk DNA could produce low levels of transcripts that would turn over rapidly in the nucleus. It was smart scientists who defended junk DNA from the onslaught of less knowledgeable scientists who thought that every noncoding RNA must have a function. This is where your history is wrong. Yes, it’s true that there were (and are) scientists who don’t know very much about genes, genomes, and evolution. You can find plenty of them on both sides of the junk DNA debate. They are part of the history but not the important part. You do a great disservice to the knowledgeable experts who discovered junk DNA by dismissing them as stupid scientists who thought that protein-coding genes were the only functional parts of the genome. When I said that your review was not good science it was not because I disagree with you. It was because you got your facts wrong and because you failed to mention any of the evidence that conflicts with your own point of view. The purpose of a “review” is to discuss both sides of a controversial issue and cover all the important published work in the field. In your case, you did not discuss the view that most noncoding transcripts are junk RNA. It’s not good science to ignore opposition from knowledgeable experts. Furthermore, you failed to indicate in your review how you are able to dismiss all junk DNA by invoking functional noncoding RNAs. The implication is that there’s no such thing as junk and 98% of the human genome contains genes for noncoding RNAs. This can’t possibly be what you meant, is it? This tactic of avoiding the numbers game has been widely criticized in papers on junk DNA. I’m surprised that papers that use this tactic can still be published in 2018. Can you tell me how much of the genome is junk, in your opinion, and how much is devoted to noncoding RNA genes? If you think that functional noncoding RNA genes account for more than a few percent of the genome, can you cite the evidence to support such a claim? Can you cite the papers that refute it? Uh-oh. Starting off with a comparison to Galileo doesn't bode well. And I see that Prof. Lakhotia offers no rebuttal to any of Larry's actual arguments. I suspect he never will, and in fact appears now to have flounced. A salutory lesson that this sort of tactic is not unique to creationists. I would not like to enter a debate where the comments become less rational but more aggressive. Just because someone does not like one set of interpretation does not mean that one can "manage to get a paper published". With continuing progress in science and our understanding of nature of things, many of the old concepts/theories have to make way for newer interpretations. Obviously the concepts proposed at one time, on the basis of what was understood at that time by some researchers, can and would change. I repeat again, that I would not call the yesteryear scientists, whose ideas may have been found to be wrong in current contexts, to be 'stupid'. Please refrain from making such comments. Ideas and theories are developed and put forward in light of the understanding that the proponent had at that time. The same person may change one's ideas with a better knowledge with passage of time. Being found to be wrong does not mean to have been 'stupid'. You are free to hold on to your views and continue to have 'faith' in 'junk' DNA. I believe that major advances in science occur only when some of the long-established ideas/theories are shown to be wrong. Thanks. Here's a short list of some of the scientists who developed and supported the ideas of junk DNA and selfish DNA in the '60s and '70s: Ford Doolittle, Susumu Ohno, Thomas Jukes, Sydney Brenner, Francis Crick, Jack King, Tomoko Ohta, Charles Thomas, Herman Muller. Here's a short list of some current supporters of junk DNA: Alex Palazzo, Ryan Gregory, Sean Eddy, Dan Graur, Mike White, Eugene Koonin, Michael Lynch, Jerry Coyne, Matthew Cobb, Michael Eisen, Dan Hartl. Most of these scientists are experts in molecular biology and/or molecular evolution. The name 'central dogma' and the somewhat mis-interpreted importance only of proteins, which led, primarily out of ignorance, to the widely held conviction that those parts of the genome that do not encode a protein were 'selfish' or 'junk' and, therefore, inconsequential, had a negative impact on gaining a holistic view of eukaryotic genome organization and its function. You are dead wrong about that. None of those scientists promoted junk DNA out of ignorance and they certainly didn't come up with the idea because they thought that the only functional parts of the genome were protein-coding sequences. Take the genetic load arguments, for example. It was developed in the 1960s and it strongly suggested that most of our genome is junk. The argument was based on solid facts and a deep understanding of genetics and evolution. If you still think that most of our genome is functional then presumably you can refute those facts and theory. I assume you are not ignorant so how do you address those experts who relied on genetic load? What a depressing discussion. I expect creationists to shut their eyes and continue to deny facts when presented with evidence that refutes their position. But I expect better of an actual scientist like Prof. Lakhotia. His replies could have come straight from Jonathan Wells,Casey Luskin or someone like that. Genetic load arguments are based on estimates of the fraction of mutations that are deleterious. Those estimates of deleterious mutations are derived from measurements made in coding sequence. So either much of the remainder of the genome has no function or non coding sequence is less sensitive to deleterious mutation than coding sequence. Either is consistent with genetic load arguments. If 90% of the genome is junk then it is, by definition, less sensitive to deleterious mutations. We know from genome sequence comparisons that most of the human genome is evolving at the neutral rate so these two bits of information strongly suggest that most of the genome is insensitive to point mutations and small deletions. That doesn't rule out bulk DNA hypotheses but it does rule out a genome that's full of genes for functional noncoding RNAs. That's why I asked Subhash Lakhotia to reconcile his claim with the known facts about genome evolution. He claims that the scientists who studied genetic load and neutral theory were ignorant about noncoding RNAs but I don't see how that refutes their work even if it were true (it isn't). One has to be a bit of an ultra-selectionist to assume that most of the genome is functional. I am often frustrated by the way the terms "selfish genes" or "selfish DNA" are used. As I learned these terms, long ago from the book The Selfish Gene, the idea is that genes exist to produce more copies of themselves. Our genes produce our bodies because our bodies are effective at reproducing, at making more copies of our genes. If we anthropomorphize genes, genes don't make us for our sake, but for their own. They are selfish. The selfish genes including all our protein coding genes and our genes that code for ribosomes, tRNA's, and all the more recently discovered functional RNA's. Of course, our transposons are also selfish, promoting themselves even at the expense of the rest of the genome. Junk DNA could be called selfish in a passive way. The important thing in the context of this discussion is, genes are selfish whether or not some of the DNA is "junk." Therefore, refuting the existence of junk DNA has no effect on whether DNA is selfish. OK. A different definition of selfish DNA. That makes sense in the context of this post. "Genetic load arguments are based on estimates of the fraction of mutations that are deleterious." Many arguments for "almost no Darwinan selective evolution" do assume minuscule levels of beneficial mutation, and the arguments and the assumption are probably true. Darwinan selective evolution may well be a minor cause of molecular variation, but it is not because of genetic load, and there are still a lot of misapprehensions around. Haldane's argument assumed that the mutations were responses to changes in the environment whose effects were deleterious. The cost of natural selection (substitutional load) would not be a burden for an advantageous mutation whose substitution was not a response to environmental deterioration. I think that the main genetic load argument is not Haldane's, but the argument in terms of Muller's (1950) and Haldane's (1939) concept of mutational load. If most of the mutations in the genome were deleterious, then not only would conservation of sequences be much greater than we observe, but the depression of fitness by those mutations would be far greater than the species could tolerate. There would not be enough excess reproduction to keep the species from being driven to extinction.